Dr Irina Kansakar, a highly skilled Nepalese eye surgeon, originally volunteered with VBA and travelled to Myanmar to assist with our work in Wachet. She was so affected by her time there that she approached VBA to support a similar free clinic in her home country, suggesting a small hospital, the Reiyukai Eiko Masunaga Eye Hospital (REMEH) located in Banepa, a town in the Kavre district, one hour’s drive from Kathmandu. The hospital was established by donations from the community and runs free eye clinics once every week in remote and poverty-laden areas. Surgery is conducted four to five times a month by volunteer ophthalmologists. VBA agreed to provide ongoing financial assistance, as we knew Dr Kansakar was both skilled and passionate about her humanitarian work, and she and her colleagues are committed to helping the poor and disadvantaged from the most remote areas of their country. We want to help that valuable work to continue for many years to come. 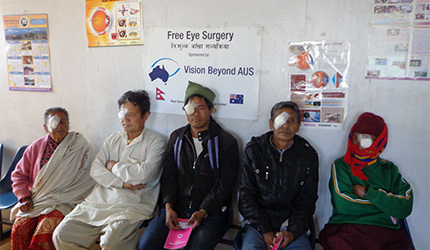 The Reiyukai Eiko Masunaga Eye Hospital (REMEH) located in Banepa, a town in the Kavre district, one hour’s drive from Kathmandu, occasionally conducts eyesight-screening clinics for children in remote areas of Nepal. When REMEH approached VBA about whether we could help fund this service for the disadvantaged schoolchildren of Nepal, we didn’t hesitate to agree. REMEH came back with a full, detailed proposal, setting a target of 10,000 children who would be eligible for free eye testing and screening. VBA agreed and the programme began in late 2013, assessing and treating 2000 children in the first month of the programme. These needy children are given a comprehensive eye test, and if they require glasses they’re issued on the spot. Any children requiring more complex care or surgery are transported to Kavre for full free treatment. Every child that is screened is given a notebook bearing the logos of VBA and Rotary International, as well as the image of a kangaroo and the flags of Australia and Nepal. On the back, the Nepalese school authorities asked to include some notes in Nepalese, alerting children to such things as the importance of eating their vegetables and keeping their faces clean! 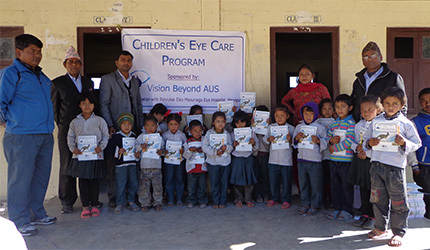 VBA will continue to run the free Children’s Eye Screening Programme for as long as the need exists in Nepal.